J.V Tierney is pleased to announce that the company has successfully achieved certification to ISO 45001:2018, the world’s newest Occupational Health and Safety Management System. The certification is in addition to achieving certification to ISO 9001:2015 and ISO 14001:2015 standards which was awarded by the National Standards Authority of Ireland (NSAI). ISO 45001 is an internationally recognised standard that ensures the provision of a safe and healthy working environment for the prevention of work-related injury and ill health. J.V Tierney, as a leader in its field, was an early adopter and one of the first Mechanical, Electrical & Sustainable Consultant Engineering Company in Ireland to achieve certification to ISO 45001:2018 Occupational Health and Safety Management Standard. 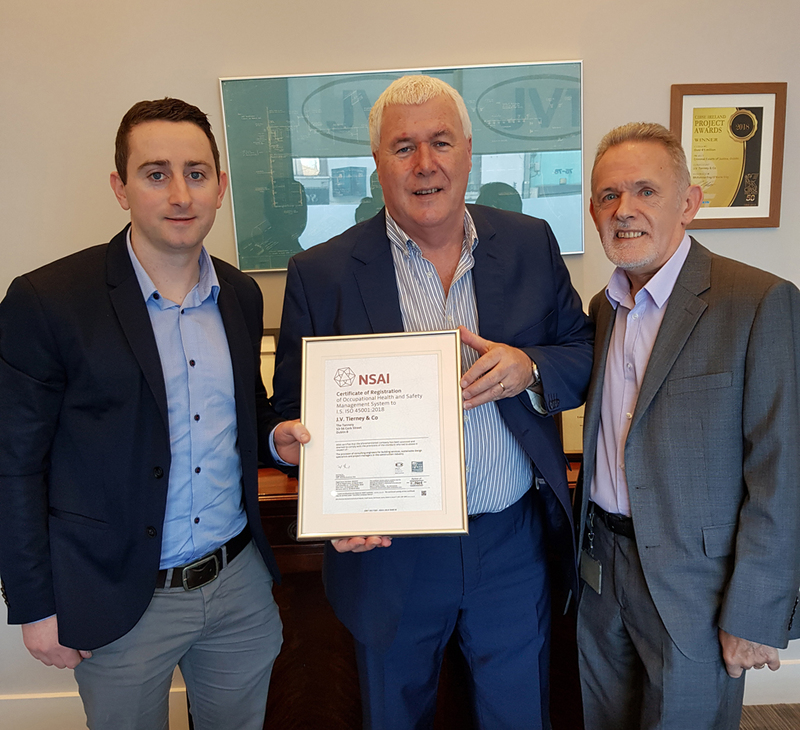 J.V Tierney were delighted to be formally presented with their certificate by CG Business Consulting’s QEHS Consultant, Noel Conaty, who assisted J.V Tierney in achieving certification to the ISO 45001 standard. Noel Conaty commented “The ISO 45001:2015 standard demands a high degree of leadership and commitment, and is underpinned by a pro-active approach rather than a reactive approach. J.V Tierney successful certification is testament to the positive engagement of workers at all levels, and demonstrates a clear desire to embrace the standard as a fundamental element of its growth and ensuring workers take an active role in OH&S matters”. According to Rory Burke, Director J.V Tierney, "Obtaining ISO 45001 guarantees that the company has implemented, among other requirements, a high-level structure with an adequate context analysis, as well as a clear focus on risks and opportunities for Workers Health and Safety management. Among J.V Tierney strengths “the top management leadership and commitment should be underlined, promoting a safety culture that is widely extended to workers and contractors”. A special word of thanks to CG Business Consulting and QEHS Consultant, Noel Conaty, for their professionalism, enthusiasm and the support provided during the journey to achieve ISO 45001 certification.